The premise of this book is that true happiness can only be found through coming to understand what is meaningful for each of us and then pursuing this amongst the demands of day-to-day life. This theme was inspired by The Alchemist. 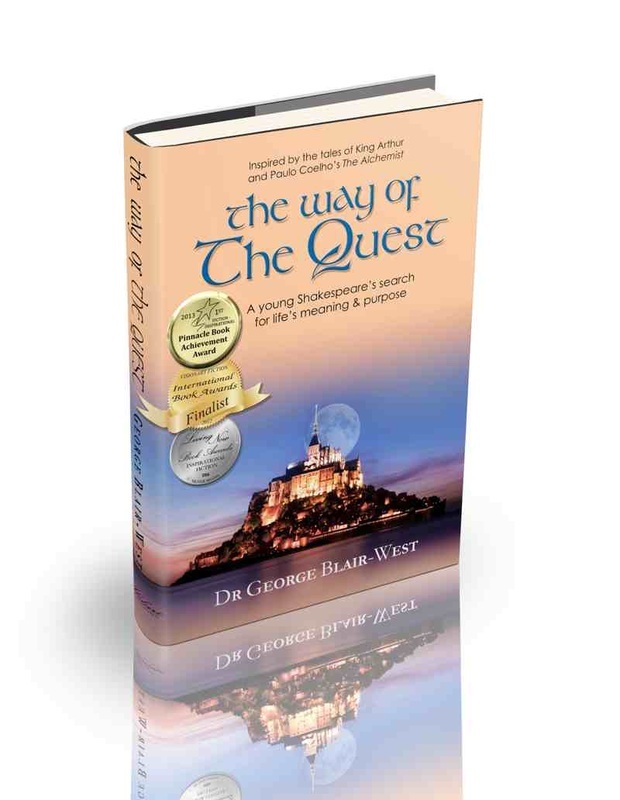 Dr Blair-West felt it did not quite go far enough into the 'how to' of pursuing ones dream and finding one's personal meaning. In therapy this is something that he helps people make sense of on a daily basis. As the story progresses our protagonist, 16 year-old Francis Bacon realises that as cool as it sounds to be a knight in shining armour, he is not that suited to it (small pun intended). He is, however, confronted with being asked some hard questions and told some uncomfortable truths that force him to change direction. However we might wish to define 'success', true sustainable success, in any pursuit, must be built on our values and what is meaningful for us - which, in turn, provides the passion that drives our purpose. While our purpose in life will evolve, no one is truly a success in their life if there is no passion in their aspirations. If you bring passion to your game you will ultimately be chosen over those who do not - no matter how much smarter or experienced they may be. When it comes to pursuing one's meaning, there is no more destructive force than fear. Understanding fear in the pursuit of overcoming it - the very process off enabling one's courage - is a core theme running through this story. While fear is often a huge signpost on the path to finding one's purpose, evil personifies what is typically feared. As this tale unfolds our 16-year-old protagonist finds himself - literally - between Archangel Michael on the one hand and ex-Archangel Lucifer on the other. The last time these two mystical supermen met, it was a battle for the kingdom of heaven. Lucifer has waited a long time for this day, and not just to get Michael to unsheath the Sword of Truth. Lucifer wants to be heard, to argue why his role is as important to humankind as is that of Michael's as the keeper of truth. Rather than ideas, humans think in questions. At its best this is variations of 'Why is that so?' at its worst: 'Why am I not good enough?' Most people have heard of the importance of learning how to ask better questions, but what this means in reality is not always clear. As the story unfolds and young Francis is required to ask a better question, precisely how to do this is explored and elucidated. Dr Blair-West's experience of women was shaped by a mother who was active in politics, Secretary of the state chapter of the Save the Children Fund and pioneer of dedicated kindergarten's for indigenous children in Australia. His father worked long hours as a family doctor leaving his eldest son (GBW) to work with his very capable mother in running a family of six. THEME 7: Who really wrote Shakespeare? Some young men of today have become a little lost in a world of female emancipation where they are out drunk and often out classed mentally and sexually by women of their age. As the father of a teenage son (and an older daughter), Dr Blair-West felt the need to provide some guidance for these youths. Through the experiences of the 16-year-old Francis Bacon, and the men he looks up to - including the greatest knight of all time - guidance is offered through a 'code of chivalry' to help young boys make sense of what true chivalry - personal integrity - was about. And then there are the insights on how what we think is cool is not necessarily what we should do! The reason this site uses PayPal is that it gives you double security. In the event that your delivery goes astray you have two levels of recourse (after contacting us first of course!!) - you can contact PayPal and notify them that you did not get what you paid for (here's the link), and you can also contact your credit card provider on the same basis and lodge a dispute. You have 90 days - in some jurisdictions 180 days - to dispute a charge to your card.